As long-term and faithful readers that you are, you'll remember that I treated myself to a lawn tractor at the beginning of the year. It came with a bundle of attachments, including a snow thrower. If you don't live around here, you may not have noticed, but we got four inches of snow last night. 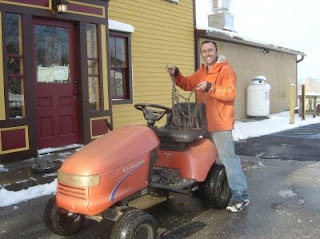 It had been on my to do list for a while, though I never found the time, to prep the lawn tractor for the white season. With the snow on the ground, there were no more excuses: Today was the day. So I got the tractor out, or I was going to, but the battery didn't like the cold temperatures, and went on strike. Out with the jumber cables, and zapp, the engine started right away. Fiddling with the chains was a bit of a challenge, but I figured it out, eventually. On went the snow thrower hitch, and I got really excited, and went to get the snow thrower (which is really heavy, upwards of 80 pounds). That's when I looked at all the pieces I had and realized that something was missing. Not finding it, there was only one possibility: I had never received it. So I called the guy I bought the tractor from, and sure enough, he still had it (he didn't have my phone number anymore, but figured I'd call eventually). By the time I had picked up the piece it was already too late to continue. So I'll finish some other time, and wait for more snow.